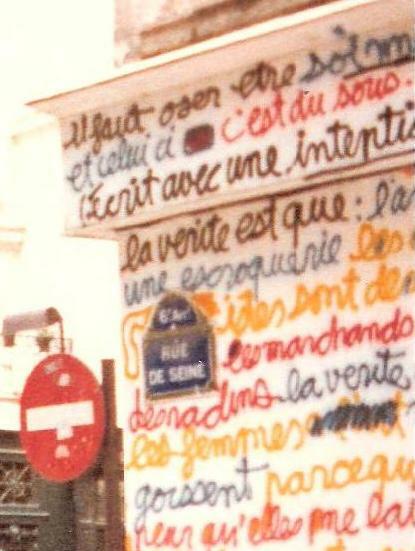 This is another of my shabby photos from 1983, taken at the corner of rue de Seine and rue Jacques Callot. It shows the restaurant La Palette and a bit of the outside of Galerie Lara Vincy when the artist Ben (Ben Vautier) covered the outside of the gallery with colored writing for his Boîtes et Idées exhibition. et celui ci c’est du sous – ? I had another photo that showed more of the writing, but it’s been lost to Time. If you want to see what the outside of the gallery looked like, I was able to find a photo online. Here’s a link.